Synopsis: The final chapter of Nolan's Batman trilogy. 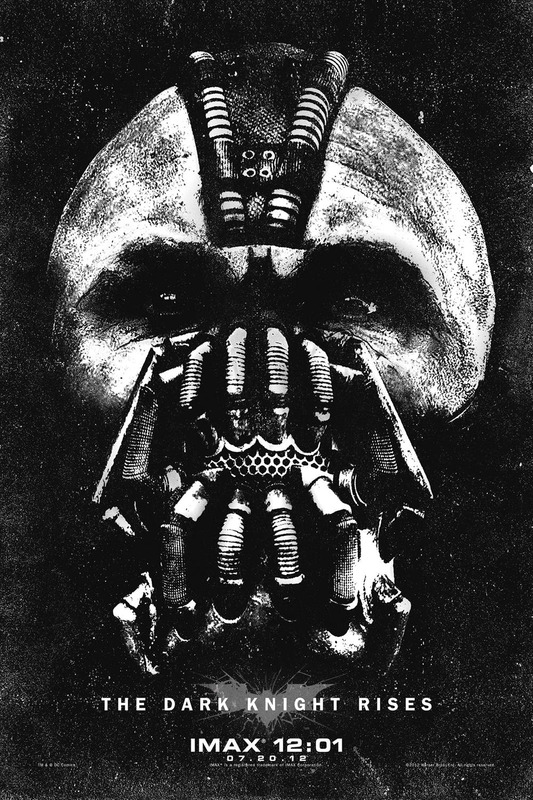 Batman must come out of hiding to defeat Bane who has plans to take over and bring down Gotham. To commemorate the end of what can only be described as one of the more important movie franchises in recent history, we will be doing something a little unusual. We will be posting short separate reviews here. Then, later on in the weekend, we will be posting a discussion that will encompass the movie in a more spoiler-y manner and in context of the entire series of movies. On a more serious note, regarding the terrible news coming out of Aurora, Colorado, we offer our condolences to the victims of the heinous shooting. We don't deal with politics here much and now is not the time, but rather a time of respect for the loss of fellow fans that were lost in a senseless crime. Javi- To say that the movie was engrossing would be an understatement. The seemingly dreaded 2 hour 44 minute run time did not seem like it was that long at all. If anything, there were times where I wish we had spent more time building certain plot points and relationships. The movie will be a stark (he he) contrast to THE AVENGERS, where that film was a relatively happy go-lucky nerd version of a sports movie. RISES had some pretty heavy stuff for a movie about a guy dressed up as a bat. This movie deals with literal and psychological breaking down of both Bruce Wayne and Batman in all of ways that made the Joker seem like he was just the warm up for this movie. It all culminates to a strangely satisfying ending to a franchise that started seven years ago. I was lucky enough to see it in 70 mm IMAX here in Dallas. The scenes shot specifically for IMAX were gorgeous are minded me of the IMAX scenes for MISSION IMPOSSIBLE:- GHOST PROTOCOL. The city of Gotham has never looked so expansive, mostly due to the fact that director Christopher Nolan decided to show a lot of the movie in the day. Pondering about that fact, I have to say that this is the Batman movie that has the brightest overall color palette. Of course, when I say "brightest" that's relative to the earlier Nolan and Tim Burton movies. The cast was largely unchanged from the previous movies. Suffice to say that everyone that is returning is top notch, with Michael Caine stealing the show as the most desperate version of Alfred I have ever seen. Newcomer VIP is definitely Anne Hathaway. Her Selina Kyle was a total badass and had some great lines except when she was getting all "1% " type of preachy. Here's the interesting thing about the movie: it still has quite a few flaws. Some are thematic, some are weird plot points, and some tie into series as a whole if you want to think about it in that context. But you never once thought about them while watching the film. I honestly think this was a good thing since I was so interested in what was going on, even if this is a sneaky, flawed movie. Having had seen it twice, I have to say that it holds up still and I felt like I was able to pick up on the themes that Nolan was trying to convey in the movie and the general trilogy as a whole. Overall, I truly enjoyed it I am so glad I got to see it twice already, and I would recommend it. Because let's face it, at this point it's a cultural event and should be seen. This is the most consistent and realized version of a superhero as we have seen on the big screen and that should be commended. I want superhero or comic book movies to become actually respected movies, being able to tell complex a story. Jonesy-What Nolan has achieved with his final installment isn’t the typical superhero story. Nolan has taken the familiar story of a broken orphan searching for a purpose and has created one of the most memorable and realistic superhero stories in film history. 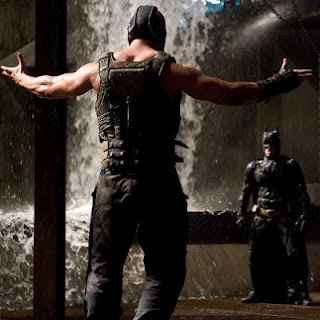 THE DARK KNIGHT RISES is a hell of a satisfying ending to this trilogy. Clocking in at 164 minutes, RISES is a daunting film. It is packed to the brim with visually stunning action set pieces and character arcs. Even with its running time, RISES doesn’t handle many of the new characters’ arcs as well as it should. We’re introduced to many new faces (Bane, Miranda Tate, John Blake, Selina Kyle), and some get ample time to develop, while others just waver there for most the film. I say this because these are such great characters to introduced to this world that I wish they had the time (maybe in a previous film?) to be just as well rounded as Gordon or even Alfred. Even with some character problems, one character that Nolan absolutely nails the final part of Bruce Wayne’s journey. After the events of THE DARK KNIGHT, Wayne is a completely broken man. Not even faithful and father-like Alfred can pull him out of his despair. In the realm of the superhero world, I tend to forget that Batman was just a normal guy at one point. Yes, he has billions at his disposal, but he can’t fly or become invisible, so he has to rely on his cunning and strength to defeat evil. Bale is tremendous (again) as Wayne. He brings an absolute realism to this character. You feel his despair and pain, and you pull for him to bounce back. One aspect that I also thoroughly enjoyed was how much underlying social commentary RISES was dripping with. It’s a testament to Nolan that he has created a genre film that speaks to the troubled times the U.S. has faced with the 1% vs. the little people. Some may be turned off with all the blatant commentary, but I loved it. And Occupy Wall Street can’t hold a candle to Occupy Gotham. Even though this isn’t my favorite installment of the trilogy, which still rests with THE DARK KNIGHT Nolan has delivered an entertaining and gritty conclusion to his series. I would say that this movie is definitely one of the best of Nolan's. Honestly, I'd have to watch it again to determine whether it's better than TDK, but if not then it's at least a close second. One thing that did bug me about the film is that the second movie seems to be less a part of the trilogy as the first and third movies. Sure, Dent died in TDK which was an influence to the TDKR, but I feel that BB has a more direct influence to TDKR. If only Ledger survived, then I'm sure that Nolan could've tied it all together to make TDK just as important and influential to the trilogy as BB.